To a lot of people Guilin is one of the best tourist landscape in China. The area is situated in the northeastern part of Guangxi Zhuang Autonomous Region in southern China. Guilin is at the heart of a booming tourist industry in China, as a result of its historical treasures and natural beauty. Spanning just about twenty eight thousand square kilometers, this is small compared to other major tourist destination in China. However, this hasn't prevented visitors from trooping in, due to the magnificent landscape, lush green vegetation, clean clear waters, funny shaped karsts or hills, and lovely caves that continue to attract tourists. This city is rich in cultural with history dating over two centuries, it has also served as an economic, cultural and political center of Guangxi right from the Northern Song Dynasty. The climate in Guilin can be regarded as monsoon climate with high humidity and four different seasons. The summer season is usually hot and humid, while winter is relatively damp and cold. For autumn and spring, the period is usually warm and short with the weather relatively comfortable and mild. Although you can visit the city at any time of the year, however, the place is most busy from April till October. The bamboo raft and the boat cruise are both magnificent options while on the river. You could also decide to take a hike to Xingping along the river from Yangdi, this experience is sure to bring you a lot closer to nature. Looking to have a really great time, while appreciating the natural scenery? Go for the boat cruise. The journey to Yangshuo from Guilin is usually one of the most sort after activities of tourists in Guilin. Estimated Travel time: four to five hours. 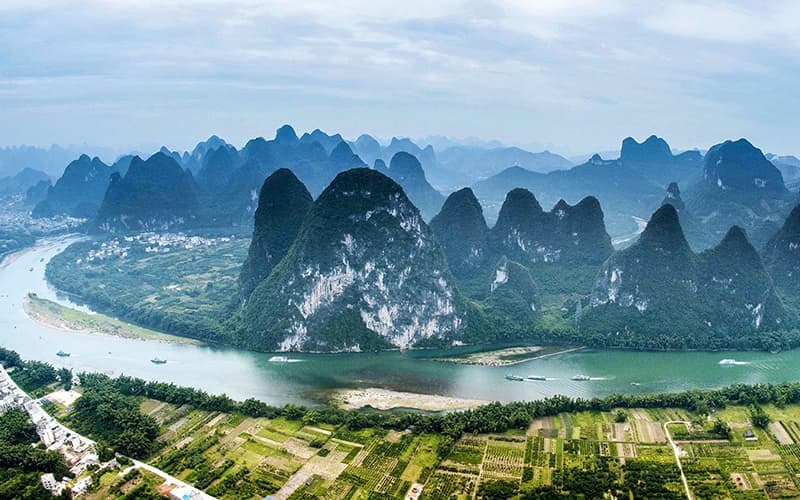 View: the view along the li river is filled with bamboo groves, magnificent karst hills and remote villages. A peek into the river through the clear waters and you will see the rocky shoals at the bottom of the river. Lovely sites through the ride include, 20-Yuan Bill Hill, Nine Horse Fresco Hill, Xingping Town and Yellow Cloth Shoal. Bamboo rafting offers you a more traditional way to move on the water, although its availability is usually determined by the current weather condition. 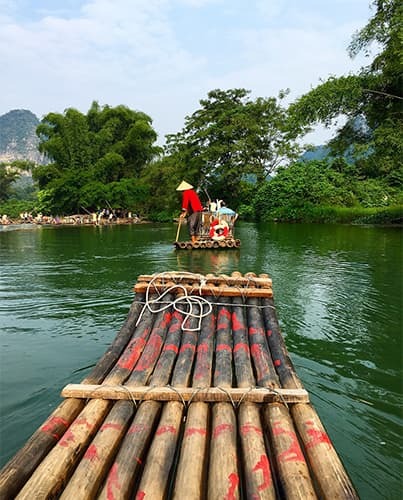 Using the bamboo offers an alternative view of the Li River, with a shorter route compared to using the boat cruise. Travel Route: Pick up – Yangdi Village, Destination – Nine Horse Fresco. Estimated Travel time: 1 hour. Ammenities: four to six seater motorized raft with adequate cover. If you are looking to pass the night, then I highly recommend that you see the Impression Liu Sanjie. The performance which was choreographed by Zhang (famous Chinese film director) is a must see. It is a lovely rendition of lights, music, and dance moves all presented on stage against the backdrop of the Li River and the neighboring karst mountains. The show runs for an hour and is on display twice every evening, unless the weather conditions are unfavorable. The stage is about 30 minutes from the west street by foot and about 10 minutes if you decide to use the electric cart. A popular traditional fishing activity in China is Cormorant fishing. Although, modern technological advancement means local fishermen no longer view cormorant fishing as a lucrative occupation. As a result this type of fishing is mostly carried out as a form of entertainment for tourist. It occurrence on the river is very rare, however, if you want to have first-hand experience on how it is done, you will have to arrange for a personal exhibition by the locals in Xingping. Hiking is another fun activity that you can participate in while on the Li River. Hiking brings you a lot closer to the natural habitat, and is also a form of exercise which is good for the health. 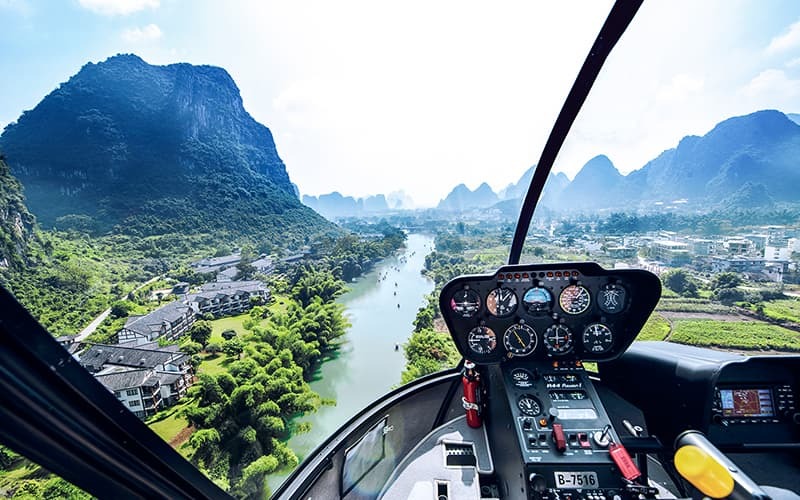 Normally, Li River has two helicopter toutes. One is from Crown Cave to Ynagdi part. The flight time is much shorter and available for most of half-day tours. Route two includes the Yangti and Xingping sections, which is the most beautiful part of Li River. The route is much longer. This route is highly recommended if you are not afraid to take a helicopter. It will be a amazing trip seeing the crystal Li River from above. A quick internet search of Li River displays lovely pictures mostly captured around Yangshuo and Xingping. You can capture these magnificent moments either at sunrise or sunset. To capture the entire landscape of Xingping, go untop the Xianggong Hill in Xingping, from there you would have a view covering the entire river and you can capture magnificent pictures of the area. The view of the village houses and multihued fields combine culture and nature together. You can also capture sunrise images from the Nine Horse Fresco Hill. For sunset images, head over to Xingping, which is to the west of the Li. An ideal spot is the twenty yuan banknote spot. It is perfect with the fishing lights shining upon the Li River, in addition to view of native cormorant fishermen. The mountains and waters of Guilin are the finest under heaven. It has long been known as a real Chinese painting. We offer you the most comfortable Guilin tour. We can also include other destinations in China for you. See those tours first and contact our travel consultant for your private tour.